The Mountain Goat – nominally Sewanee’s literary magazine but more accurately our outlet for student creativity in all printable forms – hosted a reading at Sterling’s Coffee House on Thursday, January 30th. Lead in tandem by Editor-in-Chief Aaron Browning (C’14) and Public Relations Manager Norris Eppes (C’14), the evening featured a number of student-read and -recited works, bothin poetry and prose. 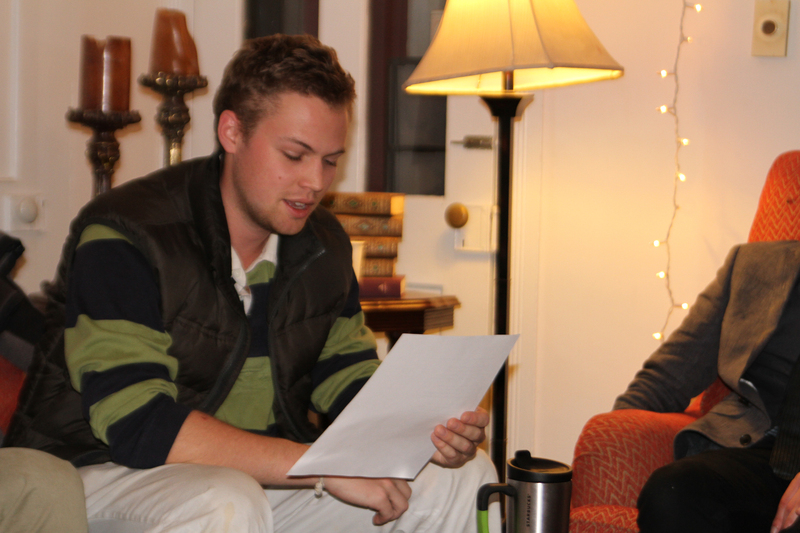 Both Eppes and and Browning read stories, and Meg Hall (C’15), and Peter Lampley,(C’16) contributed poems, among others. The event took place in the back room of Stirlings, with the roughly twenty students in attendance squeezing and cramming to all fit onto sofas and stools and around the doorway. The small environment lead to the evening feeling more intellectually intimate than cramped though. Students were invited to share work on a variety of subjects and in a range of tones, from serious to lighthearted, and also encouraged to share still-unfinished work. Hall’s poem took an experience with a broken finger to explore metaphors of direction and control of being “set straight” and made whole again. Eppes sketched a scene of the trials of self-discipline and self-doubt in young adulthood by listing, and expounding at hilarious length upon, “Eleven things that will happen to you when you try to quit smoking.” Browning’s story explored the characteristics of kindness and duty in a portrait of a young suburban girl compelled by her mother into acts of religious charity. The deadline for students to submit work to the Mountain Goat’s annual issue is March 1. Before that date, The Mountain Goat plans to host two similar events to this reading, on February 20 and 27.